This hotel is 100 percent non-smoking. Located on the Pueblo of Pojoaque just 15 minutes north of Santa Fe the Homewood Suites by Hilton Santa Fe-North NM hotel has 81 suites nestled in the rolling hills of Northern New Mexico. The Towa Golf Course Resort is only steps away from your apartment-style suite. The views at the Homewood Suites hotel in Santa Fe New Mexico are magnificent and as soon as you step into our lodge you will know you are truly in the Land of Enchantment. The Homewood Suites hotel in Santa Fe New Mexico offers a 100 guest satisfaction guarantee. Your hotel suite is well appointed with art and colors appropriate to the Native American community. The Homewood Suites hotel in Santa Fe New Mexico offers four types of suites including two bedrooms. Deluxe suites are available in casitas /separate buildings/ with spectacular views of the Towa Golf Course Jemez Mountains and Sangre de Cristo Mountains. All Homewood Suites hotel guest rooms have a fully-equipped kitchen microwave oven stovetop coffee maker two phones and complimentary high-speed Internet access. Ironing board iron and hair dryer are standard in all suites. The business center and the fitness center are complimentary to our guests. Earn valuable HHonors points and miles during your stay. Need meeting space during your visit. The Homewood Suites Hotel in Santa Fe New Mexico has a 900 square foot meeting room that is spacious and centrally located in the hotel. Wake up to a full complimentary Suite Start breakfast served daily in our lodge. In the evenings Monday through Thursday return from your day*s activities to a light meal and beverages as a guest at our complimentary Welcome Home reception. Snacks and sundries are available at the Suite Shop in the lobby around the clock. 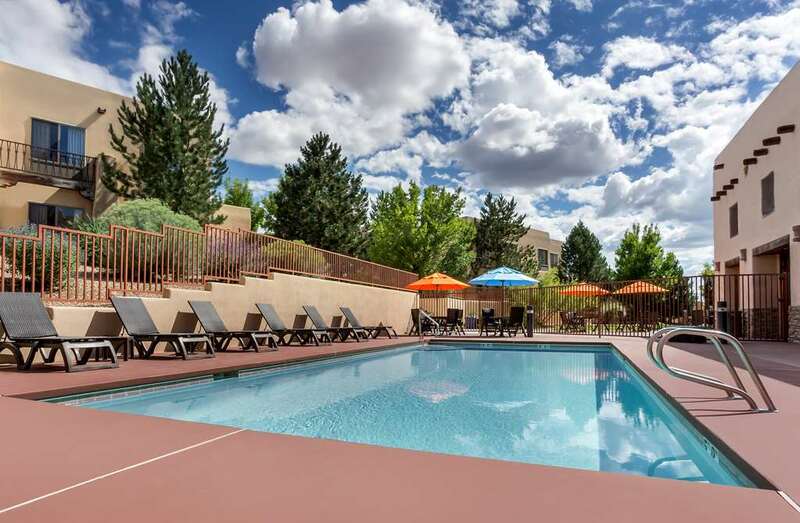 Use the Homewood Suites hotel in Santa Fe New Mexico as your home base when you explore all that Northern New Mexico including Santa Fe Los Alamos and Taos has to offer. Make Yourself At Home.